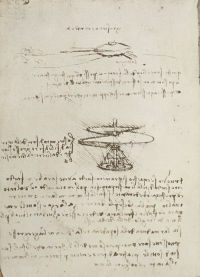 Paris Manuscript B is the earliest of Leonardo’s bound manuscripts, with the Codex Trivulzianus. 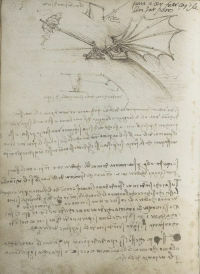 It contains drawings and notes relating to a range of subjects, the most famous of which concern mechanical inventions for flight, such as the so-called helicopter, a submarine, and architectural studies with designs for churches based on centralised plans. 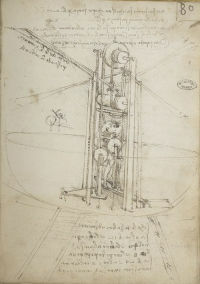 There are also designs for engines of war with which Leonardo had hoped to win Ludovico Sforza’s favour. Originally together with the Codex Ashburnham I, this notebook comprised of 50 double folios or 100 pages with an additional five loose sheets. The original binding now contains 84 folios.